Special order "Full Story" Opera Bracelets take 6-8 weeks to create. 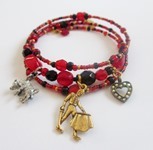 "Full Story" Opera Bracelets wrap around the wrist approximately 4 times and include many larger beads and 4-7 charms. A story chart explaining the symbolism of the beads accompanies the bracelet. Special order "Full Story" Bracelets are $96.00 plus a design fee of $150-200 (depending upon the complexity of the libretto). "Full Story" Opera Bracelets can only be created for works published prior to 1923 due to copyright restrictions. Special order "Inspired by..." style bracelets take 2-3 weeks to create. "Inspired by..." Bracelets wrap around the wrist approximately 3 times include a few larger beads, 3 charms and a card explaining the bracelet's meaning. Special Order "Inspired by..." Bracelets are $48.00 plus design fee of $50.00 (Total $98.00). 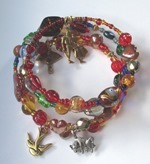 "Inspired by..." bracelets may be designed for many subjects such as songs, characters, operas published after 1923, etc. Custom bracelets purchased in quantity follow wholesale pricing guidelines plus the appropriate one time custom design fee. Click here for the Wholesale page. Special order Earrings take 2-3 weeks to create. $28.00 base price for earrings along the lines of the existing collection plus $20.00 design fee (Total $48.00) Additional fee for gold filled or sterling silver filled earring backs. Please email me at cindy@operabracelets.com to get on the first come/first served list for special orders. Once you email me with your request and we determine a price, a 50% deposit is required to begin work. You’ll provide me with any details that may be important to you or the recipient, such as “her costume was red so I want a red bead to represent her." I spend some weeks breaking down the libretto and developing the narrative bead chart (the one that folds up into the box). I source which beads and charms will symbolize characters, events and arias in the opera. You will receive a “bead plan”, along with the narrative bead chart, to review. This is the time to make sure I have captured all the moments that are particularly special to you and that you like all the beads chosen. Basically that is the time to make changes. Once the design is finalized, I order the supplies that will be needed to make the bracelet. They take 1-2 weeks to arrive. I assemble the bracelet, probably multiple times to make sure charms lie comfortably for the wearer and don’t all gather in one spot. I create the narrative bead chart and the spiral chart. Photos are taken of the completed bracelet for you to review. Minor changes can be made at this point, but by now the bracelet is complete and ready for the balance to be paid. Then, it is shipped out and on its way to you! You email me with your idea. Usually the price is $98 as described above, unless there are special requests such as adding more charms or getting charms from alternative suppliers or abroad. Payment is due upon completion of the bracelet. Within a week or so, I send you some images of charms we can use for the bracelet, from which you choose three. You also tell me if you have a preference for gold or silver finished charms and other general color choices. People have chosen colors based on costumes, favorite colors or often a color presents itself in relation to the setting or libretto of the opera. I order supplies. They will take a week or so to arrive. I make the bracelet and send you photos. You let me know if there is anything you would like to change. Once you are happy with it, you put through payment and your bracelet will be on its way to you!